Proof that dinosaurs roamed Colorado can be seen all over the state. From fossils buried in the side of cliffs to footprints found in the rock bed, Colorado was once the real Jurassic Park. Could there be a possibility of these large reptiles still roaming the Centennial State? If you believe the stories from "eye witnesses" (What are they smoking, right?! ), Colorado could be home to a "Mini T-Rex". It's believed there's a bipedal reptile that roams southwest America, specifically, the four corners region consisting of Colorado, Utah, Arizona, and New Mexico. 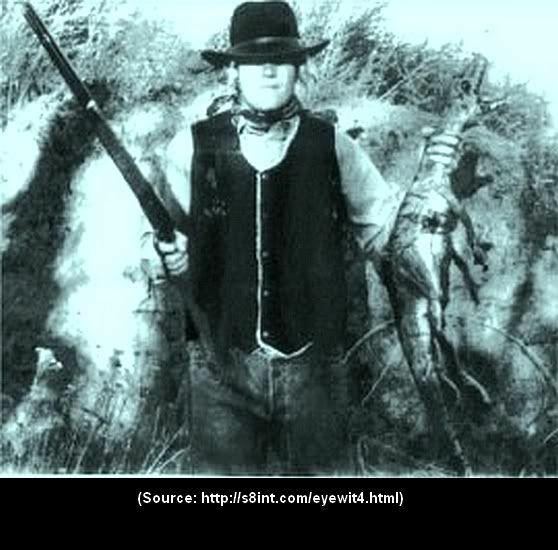 This photo, which is said to be taken in the 1800s, shows a cowboy holding what looks to be a small bipedal reptile. If you look closely, the strange creature has longer back legs than the front, a long tail, and a slender snout. In all reality, this is most likely a doctored photo, but you never know. More recently, there have been sightings in the Cortez, Colo. area, Pueblo, Colo., and Pagosa Springs, Colo. Each sighting describes a similar creature. A bipedal reptile that stands about 3-1/3 feet tall by 3 to 5 feet long. It's both similar to a dinosaur and possibly a large bird. Dinosaur experts have looked into the case and uncovered close to 11 similar stories. Colorado is full of old folklore and conspiracy theories. From the Thunderbirds on the Grand Mesa to Grand Junction's "Ute Curse." Are you a believer? Do you have an unexplained story you'd like to share?